Cam's Cinematic Episodes: A VIRTUE-ous Prequel To SEVEN??? Apparently a treatment is circulating around Hollywood for a project called Virtue that is actually a prequel to Seven. The article states that the treatment is currently being shopped around to writers to fully script. From there it will be offered to directors. The film is being set up as its own entity (Hence the vague title) and will only expose itself as a prequel near the film's closing. Immediately after reading the article I thought it was a false rumor. However, the sheer amount of press this info has gotten from reputable websites is leading me to believe there may be a kernel of truth here... So what do I think about this Virtue project? Well, I really enjoyed Seven. It was my favorite of the serial killer films (Yep, even over Silence Of The Lambs! Sacrilege!). 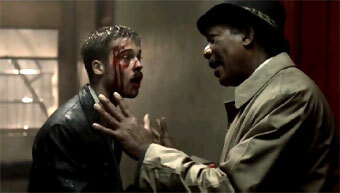 I thought David Fincher's direction was brilliant and the pairing of Brad Pitt and Morgan Freeman was genius. On top of that, Kevin Spacey was so memorably disturbed and intense that his performance is still ingrained in my memory. His John Doe (pictured) took the already great film to a whole other level. It's unfortunate he didn't get an Oscar nomination out of it... Plus, the film's ending was so uncompromising and clever that it became a deserved pop-culture reference. We never quite looked at Gwyneth Paltrow the same way again... It was the perfect closing and it defined the thriller as a masterpiece of the genre. Now, those are pretty big shoes for Virtue to fill. Now, I like that they've set it up to act as an isolated film that would only reveal itself in the ending (Though, you can bet the studio would blat antly market the film as being the next Seven film, which would make it an easy sell. Never underestimate Hollywood's greed trumping artistry, kids.). Hopefully this would mean that it wouldn't feature Morgan Freeman's earlier cases or something. Freeman exhausted his philosophical-cop-hunting-serial-killer shtick in the post-Seven Alex Cross films Kiss The Girls and Along Came A Spider (Both of which were lame wannabes). It's likely, however, that it would feature Spacey's character in his earlier stages. If this is the case, I'm not sure it's that good of an idea. The brilliance of the character was that there was no back-story to him, nothing to base our opinions on. He was a cipher who was more terrifying due to his anonymity. I'm also extremely leery of Virtue due to the fact that it will likely be made without any of the creative forces behind Seven. Andrew Kevin Walker's script for Seven was so ingenious that it seems unlikely another screen-writer could match it's Rubik's cube structure. The other key component in the film's success was director David Fincher (pictured). Fincher, after Seven, has gone on to create the brilliant Fight Club, the wonderfully suspenseful Panic Room, and the eagerly anticipated Zodiac (Also about serial killings, albeit non-fictional ones). I have grave doubts that an artist of his magnitude would be particularly interested in re-visiting his past success. Without Fincher's unique visual style and storytelling approach my concern is that Virtue would play out more as a lesser copycat than a worthy follow-up. But then, that hasn't stopped Hollywood in the past, now has it? Basic Instinct 2 anyone? Son Of The Mask? Like I said, never underestimate Hollywood's love of easy money. I'll keep watch over this story and let you know if it comes to fruition. In the meantime, go rent Seven if you haven't seen it. Caution though, it's not for the squeamish (My mom still shudders at the mere mention of it!). I've got a quick update on Spider-Man 3 that's really groovy! Evil Dead god Bruce Campbell's cameo in the upcoming Sam Raimi production has been announced. As we all know, Campbell showed up in Spidey 1 as the ring announcer at the wrestling match, and provided comedy relief as the "snooty usher" in Spider-Man 2 (For anyone who's not familiar with Mr. Campbell, go rent Army Of Darkness. It'll redefine everything you thought you knew!). Well, get ready for Campbell to play one of Spidey's greatest (and goofiest) nemeses in the summer 2007 blockbuster! 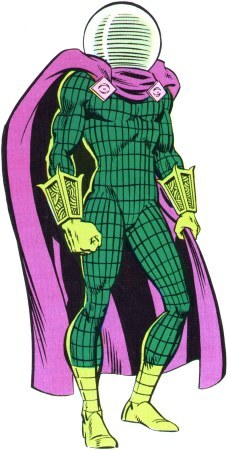 The fan community has long rallied for Campbell to play Spidey's special-effects master antagonist Mysterio. Well, Raimi and the producers listened to their inane rantings and have given them their wish. Sort of. In a scene in the film Peter Parker and Mary Jane Watson will wander onto the set of a Spider-Man movie being filmed. Director Raimi and producer Avi Arad will play themselves and Campbell will play Quentin Beck (Mysterio's alter ego), the special effects guy. H'okay folks, that's all! Hope you enjoyed what you read! Keep it real!